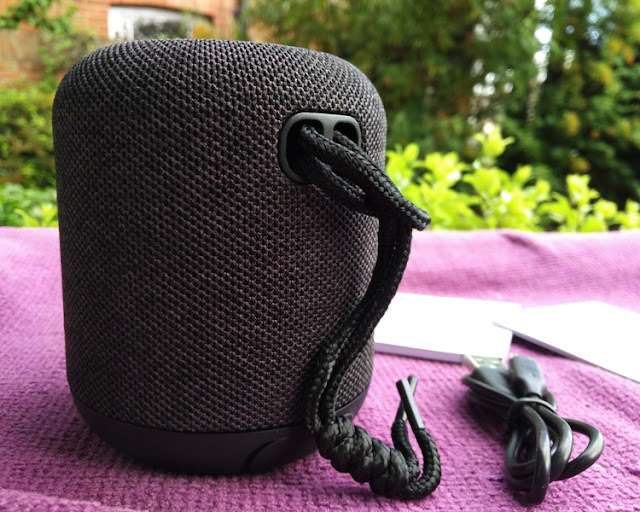 The Soundcore Motion Q is a fabric bluetooth speaker with matte rubber accents on top and bottom of the unit. 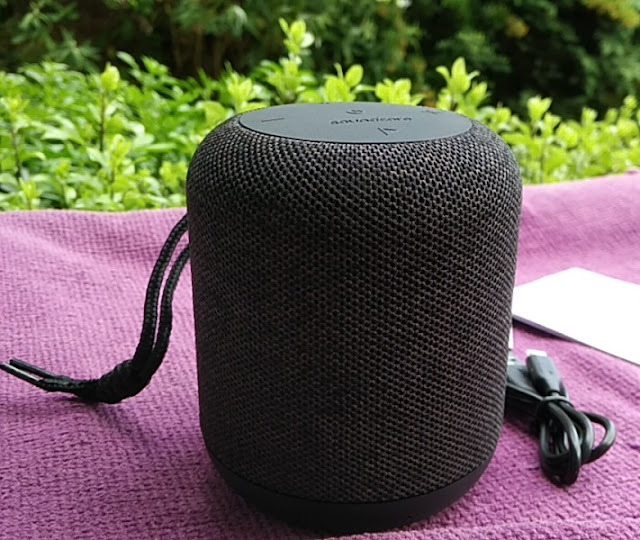 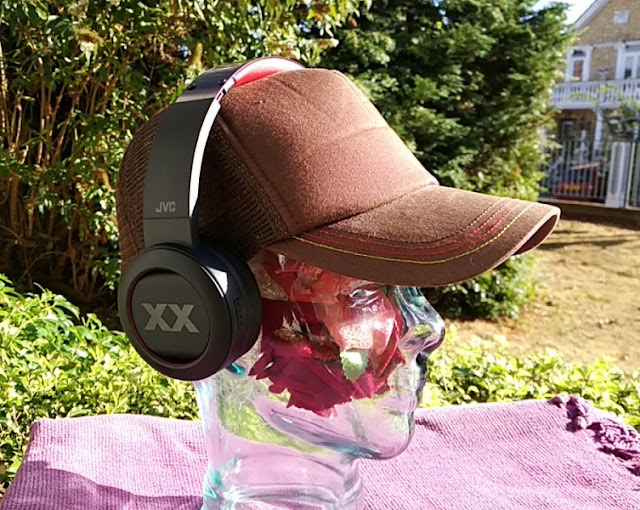 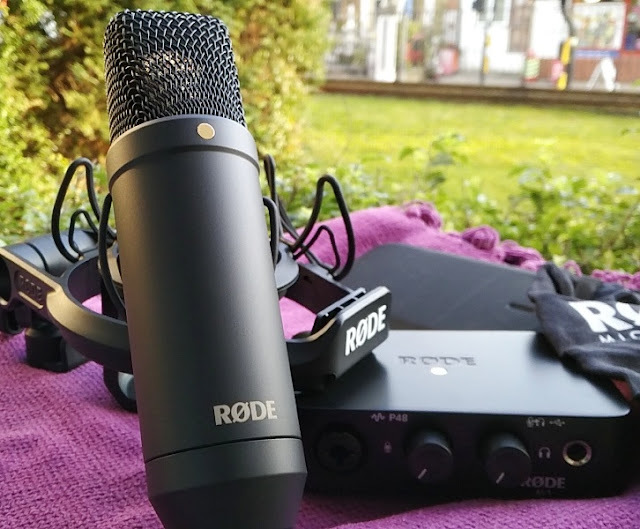 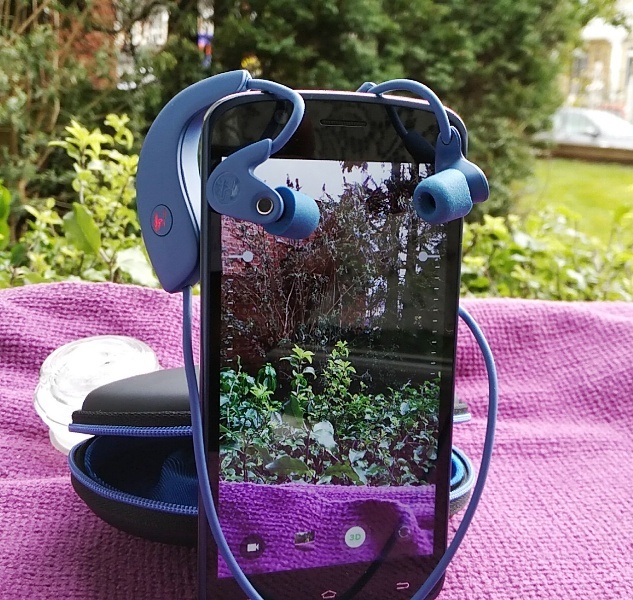 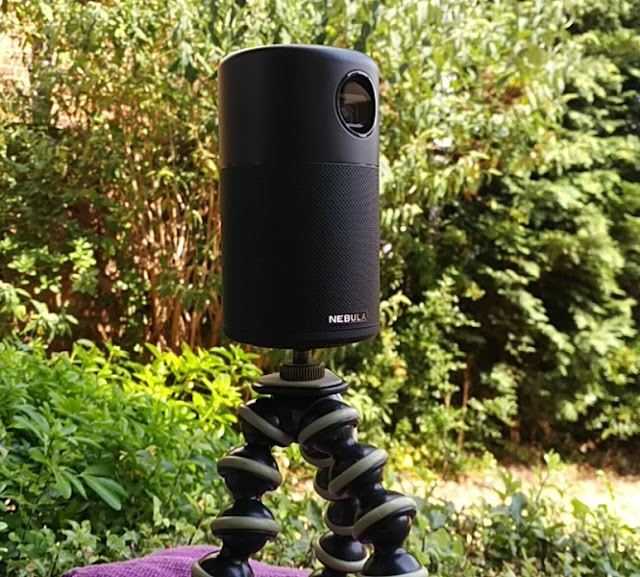 The fabric material has a IPX7 waterproof rating that allows the Motion Q speaker to be submerged under water up to 1 meter for half an hour, making it ideal for outdoor situations. 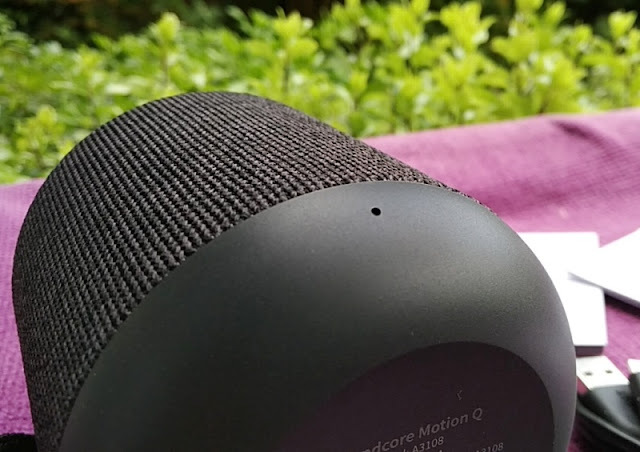 While the Soundcore Motion Q speaker is smaller in size than the Soundcore Flare+ and the Soundcore Flare, the Motion Q is a deceptively powerful speaker. 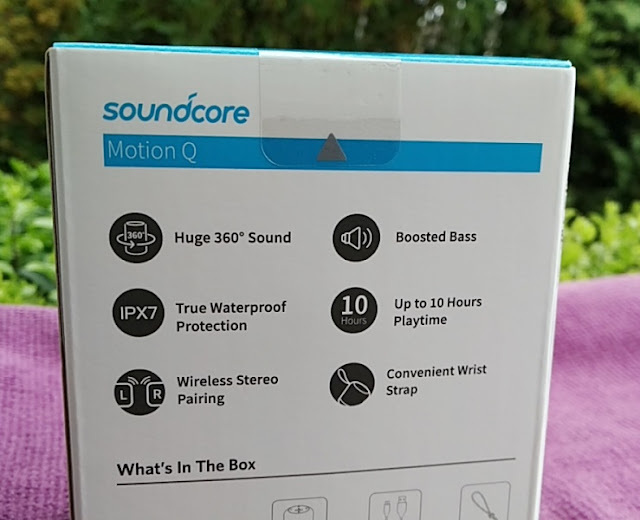 The Soundcore Motion Q outputs a total of 16W of volume power via dual 8W full-range speakers and dual passive radiators located on the front, back and sides of the unit. 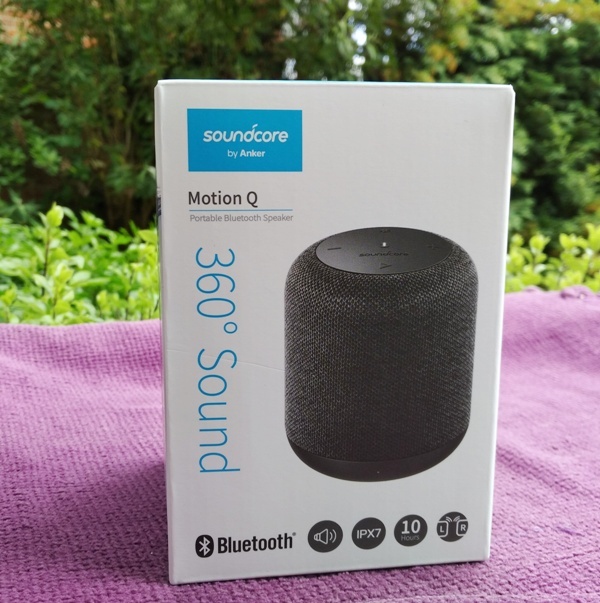 The Soundcore Motion Q speaker weighs 416 grams and measures 108mm long, 88mm wide and 88mm deep with a cylindrical shape. 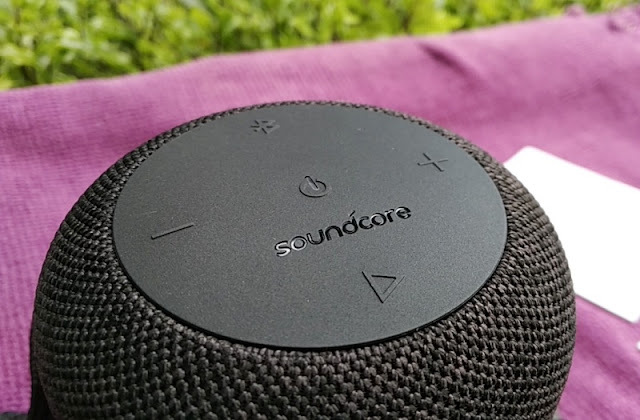 The Soundcore Motion Q speaker also integrates a "wireless stereo pairing" feature that lets you connect the Motion Q speaker to another Motion Q speaker for true wireless stereo sound, which also doubles up the volume level. 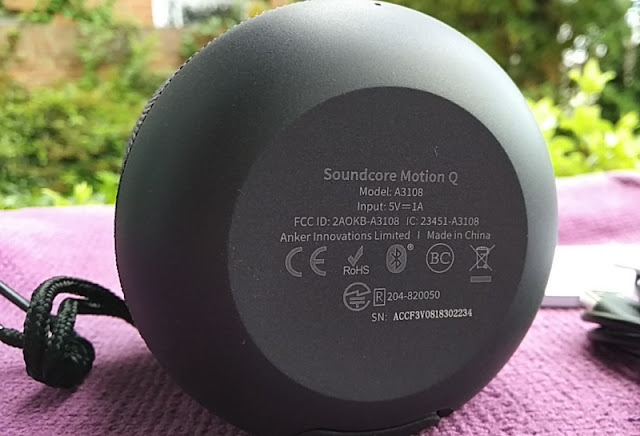 The overall sound quality of the Soundcore Motion Q speaker is very good (even over wireless) with balanced treble and bass. 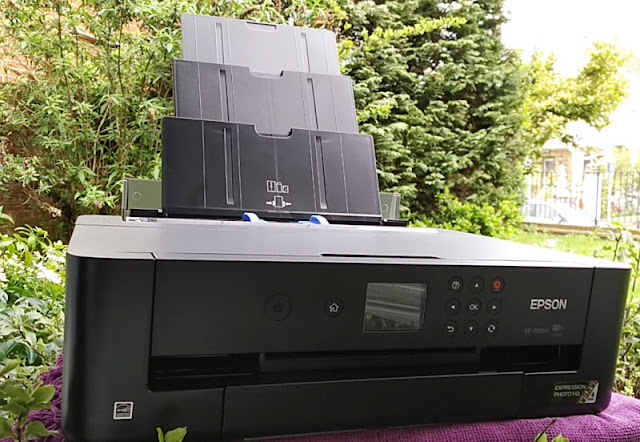 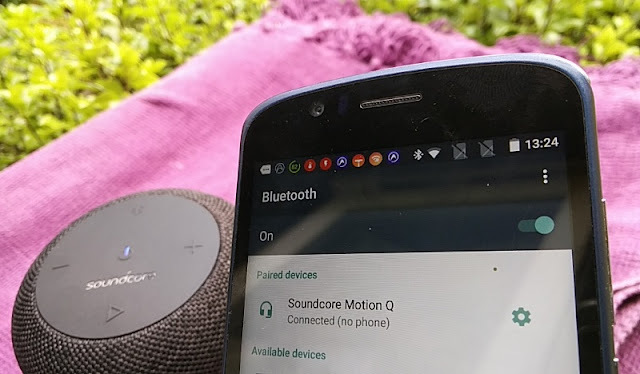 The integration of Bluetooth 4.2 EDR makes the sound noticeably better than without EDR (Enhanced Data Rate). 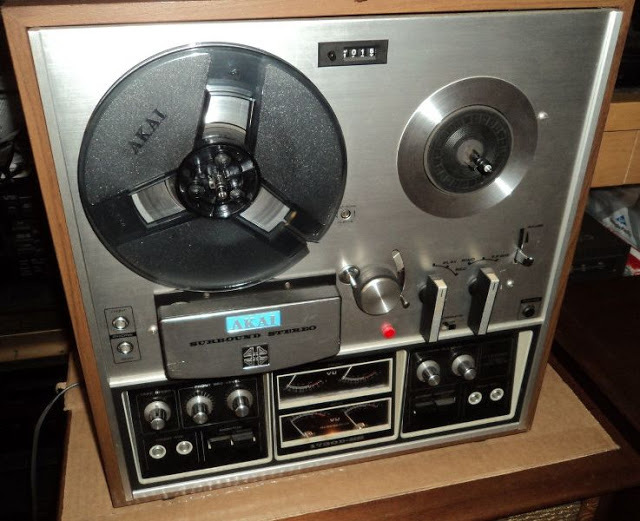 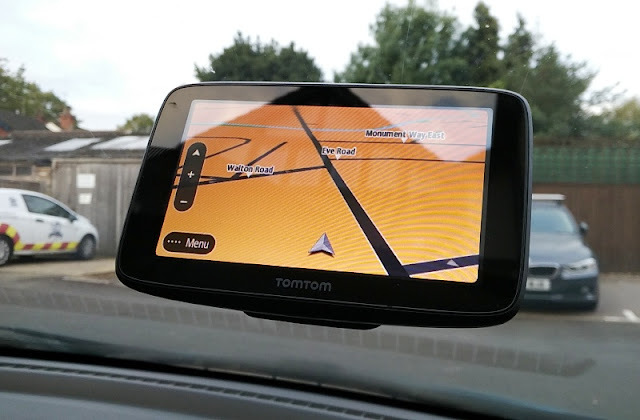 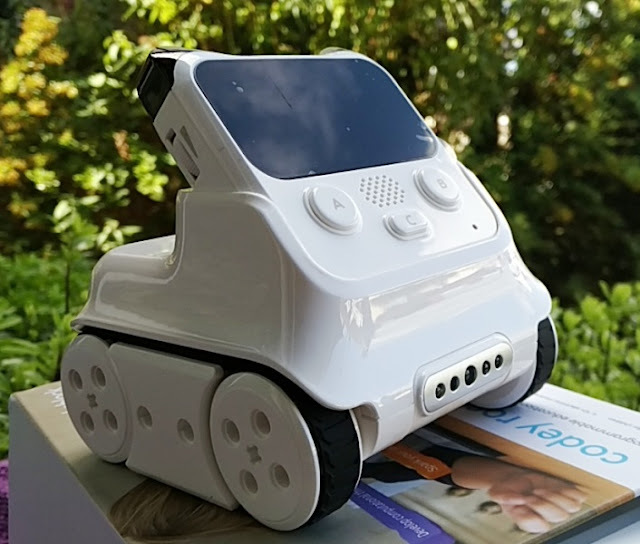 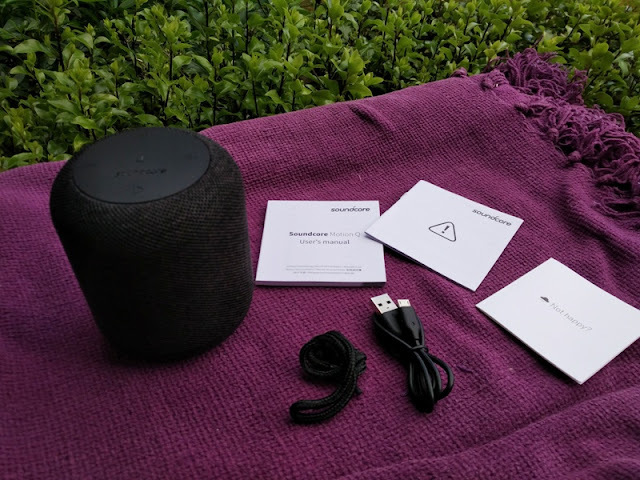 The user controls buttons are located on top of the unit and consist of three dedicated buttons (volume buttons, bluetooth pairing button, power button) and a multifunctional button that lets you play/pause audio, enter "stereo pairing", skip tracks (forward and backward), as well as access your smart assistant. 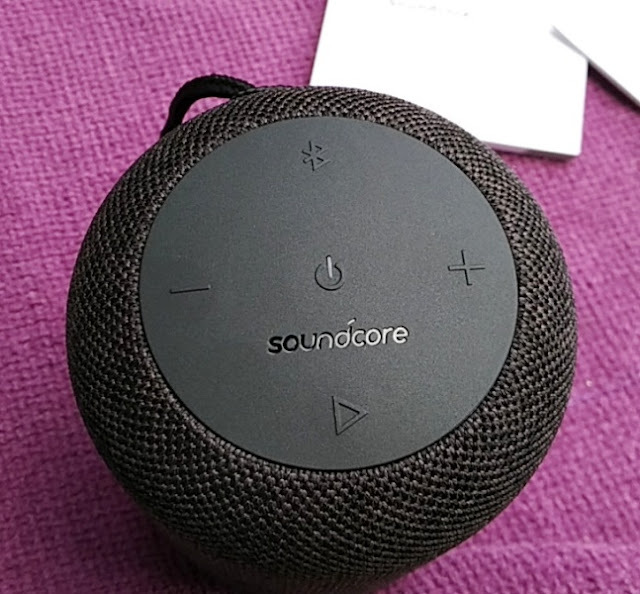 There is also a built-in microphone on the front of the base of the Soundcore Motion Q and an led that can flash blue (during bluetooth pairing and incoming calls), flash white (during wireless stereo pairing), solid red (charging) and flashing intermittently red (low battery). 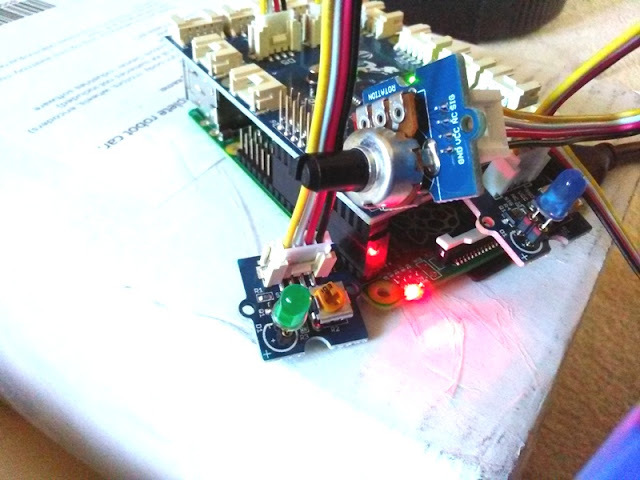 After full charge is complete (3.5 hours via 5V 1A), the led turns off. 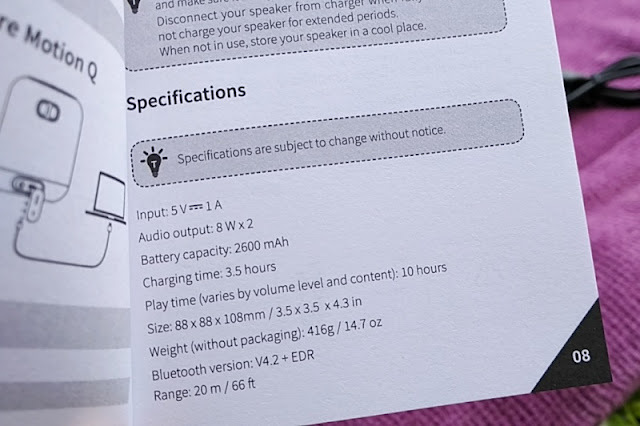 The built-in 2600mAh Li-ion battery lasts up to 10 hours. 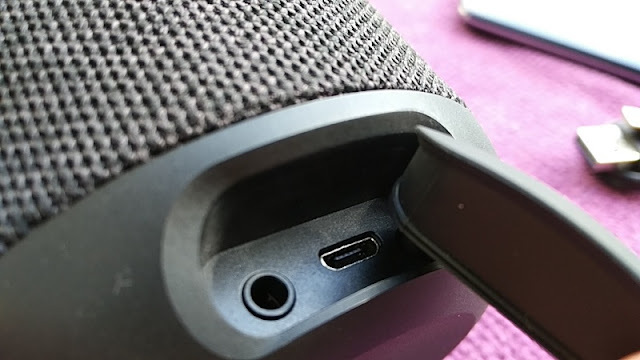 On the the back of the Soundcore Motion Q speaker, you find the opening for the lanyard rope cord and the port compartment housing the micro USB charging port and audio port. 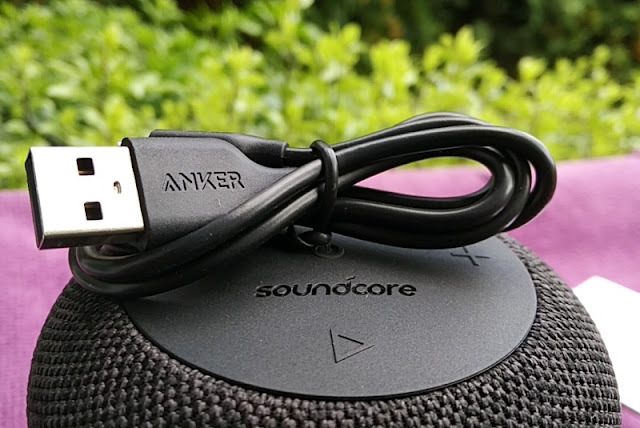 When connecting an audio cable into the audio port of the Soundcore Motion Q speaker, it automatically switches to wired (aux) mode. 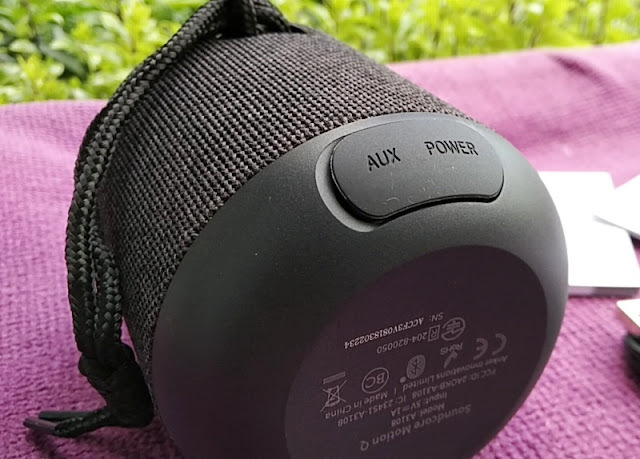 Given the compact size of the Soundcore Motion Q speaker and powerful Bluetooth signal (20 meters), you can hang it to a backpack or bike handle.